This post is sponsored by Nakturnal. It’s difficult to get it wrong when diamonds and precious metals are involved. Am I right? I’ve been especially excited about fine jewelry in recent years because jewelry designers are making modern, fashionable pieces that’ll last forever more accessible. Beautiful pieces that are long lasting and fair-priced? I’m so here for that. 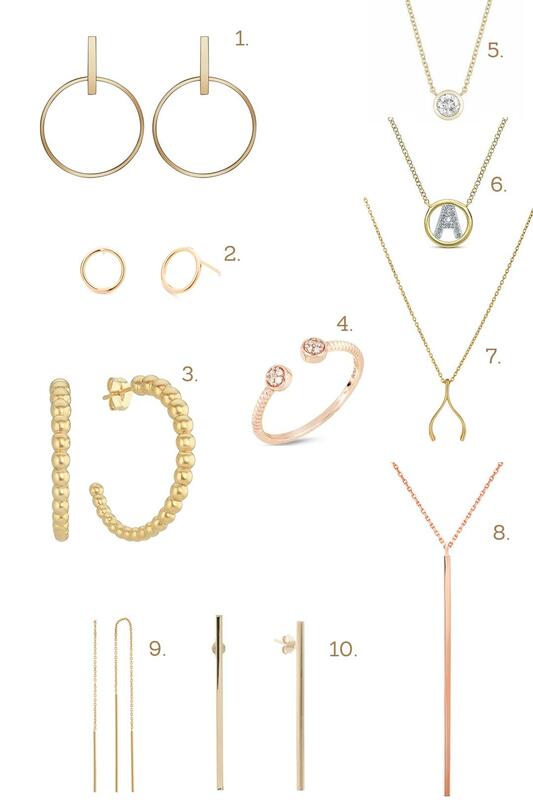 Today, I’m rounding up some of my favorite fine jewelry that’ll make the perfect wow gifts this season. What I love about the pieces in this gift guide is that they’re fashion-forward yet timeless. From dainty but edgy necklaces that are perfect for layering to IT earrings that can be mixed and matched, these pieces are just right for the fashionable gal who likes her jewelry fine but doesn’t want to compromise her style. I’m also a huge fan of these pieces because they’re so versatile. I actually own the diamond initial necklace featured above, and I wear it EVERY day. Seriously, I wear it to the gym, to the pool on vacation, and even to cocktail parties. It always provides the right amount of sparkle, no matter the occasion. And, since it’s set in 14K gold, I don’t have to worry about its shine ever being dimmed due to tarnishing. Fine jewelry gifts are like the gifts that keep on giving. All of the pieces in this gift guide are fair-priced. No doubt, precious metals and precious stones are valuable, but many of the prices on the market reflect steep markups, some as high as 10x the cost. There’s been a movement in the jewelry world, with more and more designers choosing to sell directly to customers to ensure the fairest prices possible. That movement has seemingly forced prices down in the market. Every piece in this guide is value priced. Want some inspiration for styling fine jewelry? See how I’ve been wearing my favorite layered necklaces here (and here), tiny but standout studs here, the perfect oversized hoops here, and edgy bar earrings here. Love this jewelry. All the colors are neutral so they looks good with most things I wear. Such a great way to dress up a simple blouse! They’re also diverse so I could wear them to work and when I go out. Love these!!! I love them! I’m currently eyeing one of their beautiful gold “K” necklaces. It’ll match my classic nameplate that I always wear! Thanks, Kayla! You can’t go wrong with an initial necklace. It’ll be especially fabulous paired with your nameplate necklace. I LOVE the ring (#4)! It’s so simple, but those small details also make it look so intricate and unique. But overall I’m loving all of those pieces! That open style ring is a fave of mine too, Jenny. Rose gold is my new favorite obsession! So naturally, #4 and #8 are my weakness! I hear that, Katie. Great choices! Sending this post to my husband! I want #8!!! These pieces of jewelry do look very versatile. That’s always a consideration of mine when picking up pieces for my girlfriend. That’s such an important consideration, especially with fine jewelry, Paul! Wow all of these pieces look incredible! All look like great fits that’ll last a lifetime for anyone. I see a few things that my girlfriend would love! thanks for the ideas! That’s fantastic, Matthew! Happy shopping. Great additions to any outfit to jazz it up! Love all the pieces. All of these pieces are gorgeous! Especially the rose gold ones! These pieces are all so simple and classy that I could easily wear them with any outfit. Perfect for casual or a night out! !